Marysville is a city in and the county seat of Marshall County, Kansas, United States. As of the 2010 census, the city population was 3,294. Marysville was laid out in 1855 by Francis J. Marshall, and designated in that same year the county seat. It was incorporated as a city in 1861. Marysville was located on the Oregon Trail and the route of the Pony Express, the St. Joe Road, the Overland Stage, The Military Road, and the Otoe-Missouria Trail. British explorer Richard Francis Burton en route to California in 1860 noted: "Passing by Marysville, in old maps Palmetto City, a country-town which thrives by selling whiskey to ruffians of all descriptions ..." The old Pony Express Station still stands in downtown Marysville. Marysville owed much of its prosperity to the Union Pacific Railroad, which became a major employer. But as the city grew along the railroad most of the community was across the tracks from a good part of downtown. As rail traffic increased, vehicular delays were estimated at 7.5 to 8 hours per day at the five grade crossings, which also affected emergency vehicles. In 2006 the main line was moved out of the center of town to a bypass to the south and west, with grade separations for US-36 and US-77. Marysville is also known as the "Black Squirrel City" due to an isolated community of all-black squirrels that make their homes in the town. The squirrels are said to be the result of escapees from a traveling circus. 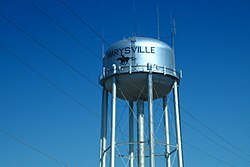 Marysville is located in northeast Kansas near the Nebraska border, about 75 miles (120 km) northwest of the Kansas capital of Topeka and 67 miles (108 km) south of Lincoln, Nebraska. According to the United States Census Bureau, the city has a total area of 4.62 square miles (11.97 km2), of which 4.58 square miles (11.86 km2) is land and 0.04 square miles (0.10 km2) is water. As of the census of 2010, there were 3,294 people, 1,468 households, and 859 families residing in the city. The population density was 719.2 inhabitants per square mile (277.7/km2). There were 1,646 housing units at an average density of 359.4 per square mile (138.8/km2). The racial makeup of the city was 96.7% White, 0.3% African American, 0.2% Native American, 0.6% Asian, 0.8% from other races, and 1.4% from two or more races. Hispanic or Latino of any race were 2.6% of the population. There were 1,468 households of which 27.2% had children under the age of 18 living with them, 46.1% were married couples living together, 8.4% had a female householder with no husband present, 4.0% had a male householder with no wife present, and 41.5% were non-families. 38.1% of all households were made up of individuals and 18.1% had someone living alone who was 65 years of age or older. The average household size was 2.20 and the average family size was 2.89. The median age in the city was 41.8 years. 24% of residents were under the age of 18; 7% were between the ages of 18 and 24; 22.2% were from 25 to 44; 26.4% were from 45 to 64; and 20.5% were 65 years of age or older. The gender makeup of the city was 47.9% male and 52.1% female. As of the census of 2000, there were 3,271 people, 1,437 households, and 865 families residing in the city. The population density was 1,004.2 people per square mile (387.4/km²). There were 1,614 housing units at an average density of 495.5 per square mile (191.2/km²). The racial makeup of the city was 98.04% White, 0.15% African American, 0.34% Native American, 0.49% Asian, 0.15% from other races, and 0.83% from two or more races. Hispanic or Latino of any race were 0.73% of the population. There were 1,437 households out of which 26.9% had children under the age of 18 living with them, 51.1% were married couples living together, 6.5% had a female householder with no husband present, and 39.8% were non-families. 36.5% of all households were made up of individuals and 20.2% had someone living alone who was 65 years of age or older. The average household size was 2.19 and the average family size was 2.87. In the city, the population was spread out with 22.7% under the age of 18, 7.1% from 18 to 24, 24.6% from 25 to 44, 22.2% from 45 to 64, and 23.4% who were 65 years of age or older. The median age was 42 years. For every 100 females, there were 89.7 males. For every 100 females age 18 and over, there were 85.3 males. The median income for a household in the city was $31,250, and the median income for a family was $40,427. Males had a median income of $28,065 versus $18,063 for females. The per capita income for the city was $19,196. About 5.7% of families and 8.5% of the population were below the poverty line, including 8.5% of those under age 18 and 4.3% of those age 65 or over. ^ Blackmar, Frank Wilson (1912). Kansas: A Cyclopedia of State History, Volume 2. Standard Publishing Company. p. 246. ^ Richard Burton, (1862) The Look of the West 1860, Lincoln: Univ. Nebraska Press, reprint, n.d., p.36. ^ "Pony Express Original Home Station No. 1". Blue Skyways. Kansas State Library. Retrieved 14 June 2014. ^ Financing Freight Improvements, Case Studies: Kansas. Federal Highway Administration, US Department of Transportation. ^ "Marysville community home page". Blue Skyways. Archived from the original on 2007-06-27. Retrieved 2007-06-10. ^ United States Census Bureau. "Census of Population and Housing". Retrieved August 18, 2014. Wikimedia Commons has media related to Marysville, Kansas. This page was last edited on 23 March 2019, at 17:20 (UTC).